The New Orleans Historic Voodoo Museum is rich in cultural and historical authenticity. Most visitors will spend about 30 minutes to an hour and half. You will be introduced to the roots of voodoo and how it is connected to Christianity. Learn about voodoo spirits, ve ves, the saints, white magic, voodoo dolls,sacred potions and gris gris bags. etc. 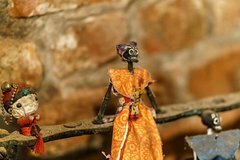 Only locally hand made voodoo dolls and gris gris's are sold here as most items we sell, and are blessed by our resident voodoo queen. You can also make arrangements for palm or tarot readings during your visit. The New Orleans Historic Voodoo Museum is open from 10am - 6pm 7 days a week, excluding Christmas and Mardi Gras. Most visitors will spend about 30 minutes to an hour and half. You will be introduced to the roots of voodoo and how it is connected to Christianity. Learn about voodoo spirits, ve ves, the saints, white magic, voodoo dolls, sacred potions and gris gris bags. etc.